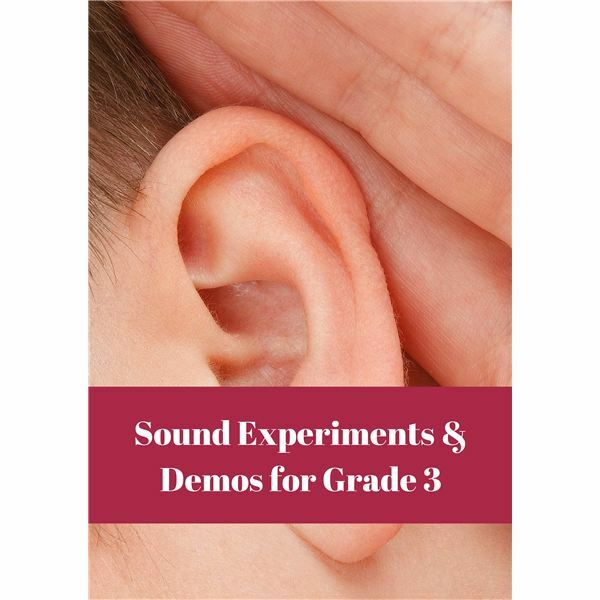 These experiments and demonstrations can enhance your study of the science of sound. When comparing results you should only change one thing at a time to make it fair. How can we demonstrate that sound is created when an object moves and the air around it vibrates creating sound waves? Blow up a balloon. Place it against your ear. Ask a friend to press their lips on the balloon and speak. You can hear and feel the vibrations through the balloon. Use clear plastic wrap and cover the top of a bowl. Secure the plastic with tape and make sure the top stays tight. Place a spoonful of uncooked rice or puffed rice cereal in the center of the plastic wrap. Turn on a radio close to the bowl and observe what happens. Bang on a pan and observe. Set a cell phone to have a musical ring tone. Put the cell phone in the bowl before covering the bowl. Then call the cell phone and observe what happens when the music plays. Place your hand firmly midway on your throat. Say “Ahhhhh" for as long as you can and feel the vibrations. Can sound travel through solids? How is sound different when heard through solids? Ask someone to talk softly on one side of a door while you stand on the other side. Can you hear them talking better when just standing there or if when putting your ear up to the door? Use two pieces of string and tie each string to one end of the base of a wire hanger. Wrap the other ends of the string around the ends of your index fingers. Place your fingers gently to your ears, bend over letting the hanger swing and bang the hanger on a chair or table. Then try it without the string to your ears. What do you observe? Next, try a spoon or another object. Can sounds travel through liquids? How is sound different when heard through air or water? Use a plastic water or soda bottle. Cut off the base of the bottle. Fill a tub or basin about 3/4 full with water. Place the plastic bottle in the water. Put your ear to the top of the bottle. Using two rocks, ask your friend to knock the rocks together under water. Now repeat the experiment above the water. What do you observe? What makes sounds high or low? What makes sounds soft or loud? Adding more energy makes a louder sound. Use a drum and your hand, a plastic bowl and wooden spoon or even your own voice. Try starting out with just a little force: pat the drum softly, hit the bowl gently or whisper if using your voice. Then gradually increase the force and see how loud the sound becomes. Thomas, Isabel. Experiments with Sound. Heinemann Raintree, 2015.